The Department of Urology at Montefiore offers blue light cystoscopy, a unique FDA-approved technology used to detect and diagnose tumors in the bladder. Also known as Cysview®, this enhanced imaging procedure helps oncologists find bladder tumors more easily than standard cystoscopy, which can miss some tumors that are too small to see. Cysview (hexaminolevulinate HCL) is a colorless contrast solution that accumulates in rapidly growing cells (such as cancer cells) and turns bright pink or red under a blue light. In the images below, the bladder tumor is essentially invisible under white light (left). 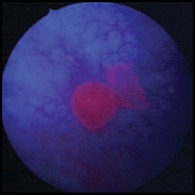 With Cysview, the tumor can clearly be seen under blue light (right). Improves detection so your doctor can see and remove more cancerous tumors. Allows better disease management by removing more tumors. Imaging of bladder tumors using a molecular tool. Better tumor visibility and more complete removal. Decreased rates of tumor recurrence. 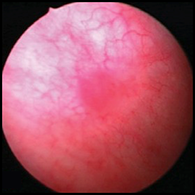 The best candidates for blue light cystoscopy are patients who are suspected or known to have bladder tumors. Talk to one of our doctors to find out if this breakthrough technology is right for you. Call us at 718-920-4531 to get the care you need now.